Storify is a free tool (paid options available) that lets you collect together a whole load of tweets on a topic, or from a person, or a conversation and re-order them so that the oldest tweet appears first. Not just tweets, any ‘atom’ of social media (a blog post, a YouTube video) can be included in the story, and you can insert commentary in between the different items. If you have a Twitter account you can authorise Storify via Twitter, so you don’t need to create a separate account. Here’s what the top part of the interface looks like, on the left is the editing window and on the right are the options to collect source material. Here’s the options panel enlarged, with the Twitter option selected. There are a number of sub-options within each option. The sub-options are Search (shown, left), User (type any user’s name in to see their tweets, Favorites (type any user’s name in to see their favourites), Timeline (to see the tweets of people you follow) and List (type in the web address of a list to see it [example]). Another useful option, hidden within the three dots ••• is the Embed URL option which lets you take the address of anything on the web and add that in (including tweets). You can also connect your Instagram account in order to search other instagrammed pics, but if you don’t want to do that just find the pic’s address on Instagram and use the Embed URL option to put it in the Storify. A typical use of Storify is to collect all tweets that contain a particular hashtag. To do this you’d just type the hashtag into the Twitter search option as shown above. Once you’ve done this it’ll tell you how many you’ve found and give you the option to ‘add all’ or click and drag the ones you’ve got. I strongly recommend ignoring this and scrolling to the bottom to the ‘find more’ link and doing that a few times then using the add all option to move them into the editing window. Once you’ve moved tweets into the left window if you then do the ‘find more’ there’s a risk you’ll end up with duplicates. If you wish, click on the Reorder option at the top of the editing window and arrange them so that the earliest tweet is displayed first. Note that if you’ve added any commentary (by clicking in the space between tweets which creates a new text box) then this will be pushed to the bottom, as it was created most recently. I strongly recommend getting all your tweets and other items in the order you want before adding in text comments. You can use Twitter search operators to capture conversations. For example from:adamrutherford to:deepakchopra will bring up one side of a rather entertaining conversation, and you can reverse it to get the other side. You can bring up both at once by typing adamrutherford deepakchopra but note that this will also bring up tweets from other people joining in (which you may want of course). If there’s a tweet you’re after you can search for it on Twitter and copy its address (URL) from its timestamp, shown below in the link saying Aug 5. Right click, copy address will copy the tweet’s URL. 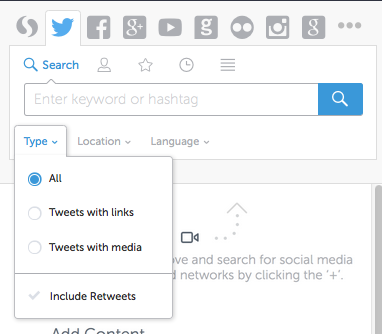 Use the Embed URL tool to search for the tweet via Storify and then drag it into place.